Justine in Russia: Week 1! Hi! It’s been able a week since I arrived in Saint Petersburg. I’m a little surprised at how much and how little time I’ve spent here so far (makes no sense, but let me elaborate). My first day in Saint Petersburg was not actually in the city, but instead at a hotel in the outskirts of the city, next to Pulkovo International Airport. CIEE holds orientation at the hotel for the first two days and depending on our housing situations, we all leave the hotel separately. The first days were stressful because the people who chose to live with a host family, were not given any information about them up until the day we arrived. I found out that my host family was just one person named Lyudmila, who was most likely going to be a grandma. I was not afraid of the fact that she was an older woman, but I was afraid of our language barrier considering I only know 1 semester of Russian. At the end of our two long days of orientation, it was finally time for us to be picked up by our host families. I finally met Lyudmila (she insists I call her Lyuda). I was terrified as I walked out to meet her, but everything turned out to be fine. I found out that she has hosted students with zero knowledge of Russian, which is a bit interesting to me considering she only knows a few words in English (like mushroom, chicken, day, morning). So far, we understand each other alright. I would say I understand 80% of her sentences, but occasionally I do have to pull out Yandex Translate (not Google) in order to respond to her. We have breakfast and dinner together every night (all 3 meals on weekends), and I have enjoyed our conversations so far. About 20% of our meals are just us smiling at each other, but it’s okay. I got a bit sad my second night here because I really wish that I am able to talk to her more about her life, but she said it’s completely normal for me to not know much right now. As days go by, I am able to talk to her more since I have language class almost everyday and I am happy with my progress so far. My bedroom in my host mother’s apartment! An interesting thing I realized the past week is that Saint Petersburg has about 5 million residents, but I found the city to be extremely quiet. There are tons of people walking around and tons of cars/buses/trolleybuses going up and down the streets, but there is something extremely peaceful about the city. The only downside to this city so far is that there is so much snow to the point that the sidewalks are completely iced over and I even see locals slipping and falling (I fell only twice so far). My apartment is close to the city center, but far enough for it to be non-touristy. As for the city, I have not explored much so far, but I did go to The Church of the Savior on Blood. I am not going to try to describe how this place blew me away, so I’ll just provide pictures of it. Outside the The Church of the Savior on Blood. The ceilings inside the The Church of the Savior on Blood. My commute to school is approximately 40 minutes, but I am used to longer commutes since I am from New York City. We actually did not have class the first day of school, but we did have our language placement exams. I actually placed into Intermediate I (equivalent to 201), which I was happy about since I did not really review at all the past 1.5 months of winter break. I’m sorry, no one told me I would be going to school in a PALACE. So far, I’m really enjoying this city, but there are still many things I have not done nor have I seen and I am really looking forward to sharing my experiences. Janus in Singapore: Which God? 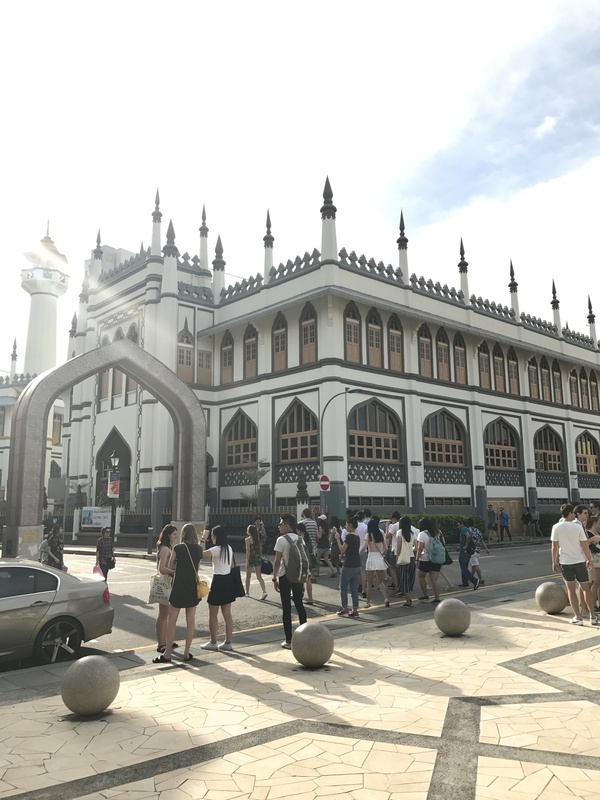 Something struck me when I was going through the various photos I’ve collected from my time here in Singapore – there are quite a number of religious buildings in the city. I’ve never thought of Singapore as a particularly holy place, unlike certain parts of China or the Philippines that I’ve been to with comparable numbers of religious buildings, nor did I think that an extremely industrialized and advanced city would have such a strong presence. There are five religions that have a significant presence in Singapore. According to the 2015 census, 33% of Singaporeans practice Buddhism, 18.8% practice Christianity, 14% practice Islam, 11% practice Taoism, and 5% practice Hinduism. These numbers make sense to me; a majority of Singaporeans are Han Chinese, with Malay and Indian groups representing about 10% of the population, each. 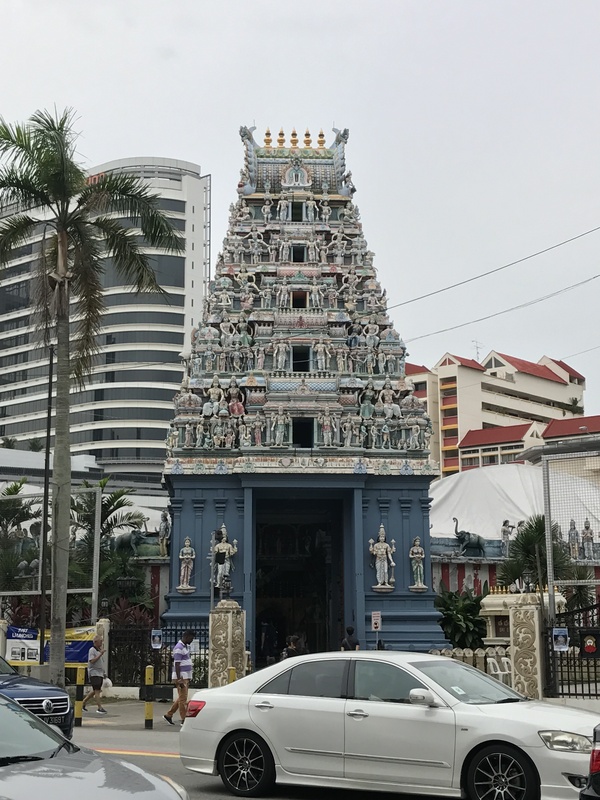 It makes sense that Buddhism, Taoism, Islam, and Hinduism play such a big role in the lives of Singaporeans – these religions are the religions in the various ancestral homes of the people living in this city. I didn’t expect such a large Christian presence, though. While I was in China, I didn’t encounter many Chinese Christians, nor do I know of a large enough presence of Christianity in Malay and Indian countries that could explain the 18.8% figure, a percentage that has apparently increased in recent years. According to census figures, 12.7% of the population was Christian in 1990 and 146% in 2000. 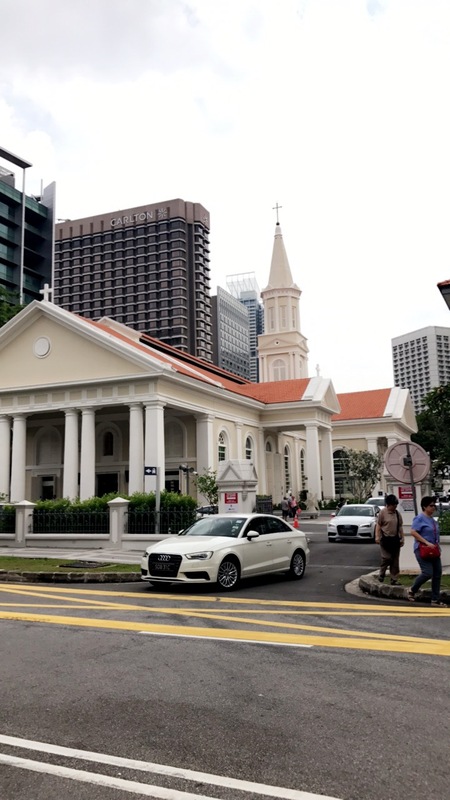 While one I can understand that there should be a a small presence – Singapore, after all, was a British colony – I’m not quite sure why Christianity has a growing presence. 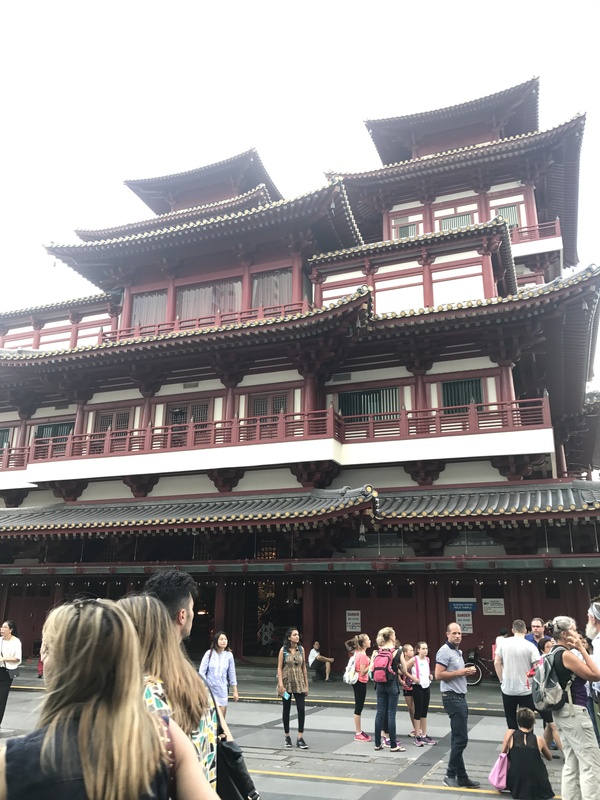 You would expect that the Singaporeans’ ties to religions more closely related to their ancestral homes would increase in popularity, rather than a religion that was introduced by foreigners that no longer have a strong hold on the country. Another interesting aspect of religion in Singapore is that the number of highly educated Singaporeans practicing a religion, particularly for Taoism, Hindiusm, and Islam, is increasingly noticeably. This goes counter against a fairly commonly observed phenomenon where religion becomes less and less important the higher the level of education. I’ve seen this myself at SMU – the various religious clubs are very active in the community, and it isn’t uncommon for me to run into classmates at Sunday masses during the weekends, or even the odd weekday mass that I attend. Practicing my Catholic faith has definitely been much more easy to do in Singapore, simply due to the number of parishes that make it almost impossible to not attend Sunday mass. 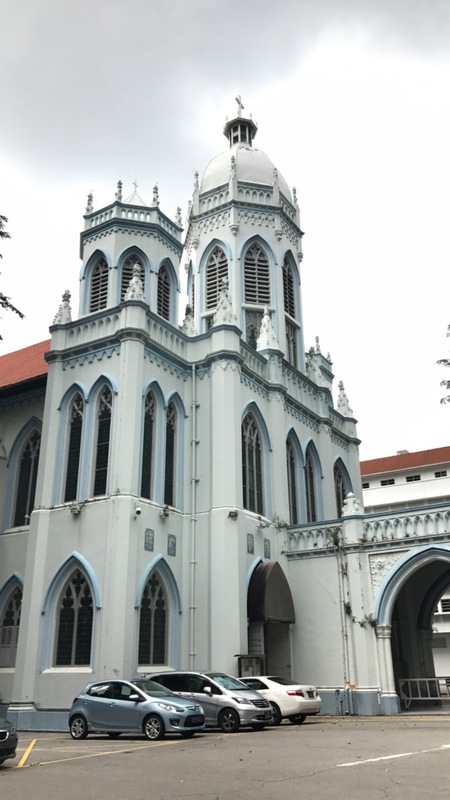 There’s a church a 10-minute walk away from my flat, and on weekdays or Sundays spent at the library, Singapore’s oldest cathedral is simply across the street. There’s much more to learn about religious life in Singapore, particularly for the non-Christian religions. While I feel like I’ve touched the surface of what can be learned – living in Little India lets me experience many of the Hindu religious holidays, my many visits to Chinatown have allowed me to enjoy the various Buddhist temples, and the largest mosque happens to be on my favorite food street in Singapore – I do plan to eventually attend a service for each of the major religions in Singapore. It’s an opportunity that I wouldn’t necessarily have elsewhere, and my fellow exchange students who have done the same say that it’s a truly interesting experience to have. Decorations outside a Hindu building in Little India, a minute or two’s walk from home. St. Joseph’s Church – another relatively large Church in Singapore. Unfortunately, the building isn’t very well kept, and almost seems like a relic of a past decade.